Using produce when it is in season makes every difference in the taste of your dish. This month is the start of fresh peach season. Fresh peaches are just bursting with flavor - and the aroma is out of this world. If you are lucky enough to have a peach tree, you know just what I am talking about. 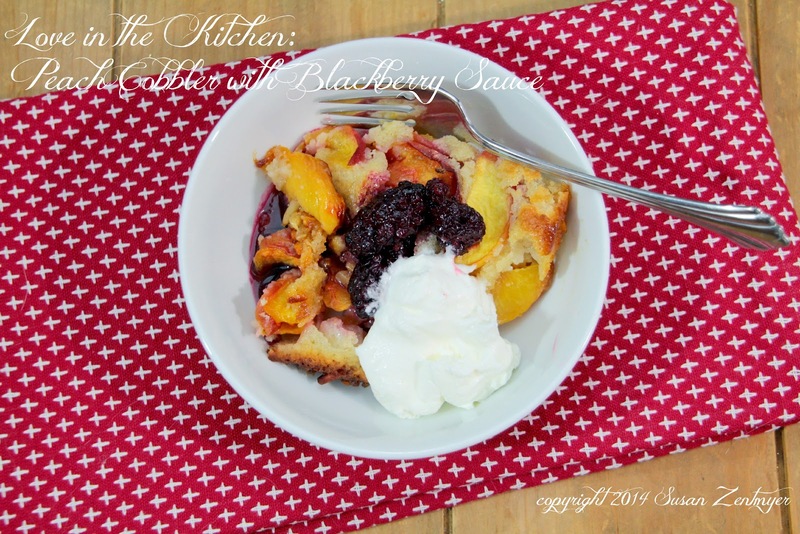 This peach cobbler brings out the best flavor of fresh peaches. 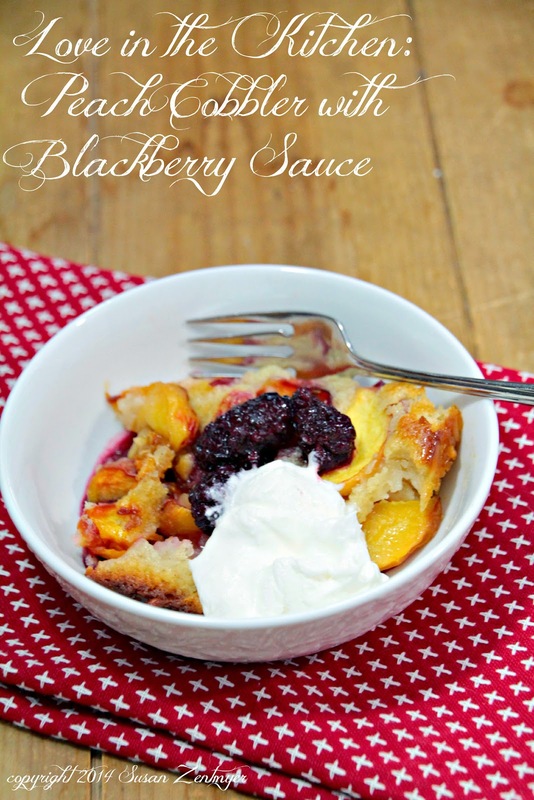 Blackberries in red wine sauce bring a rich, deep flavor, and the crunchy almonds in the crust give this a beautiful texture. When choosing peaches, pay attention to the background color, particularly around the stem. If you see some green, it means the fruit is not yet ripe. Leave it at room temperature for a day or two, though, and it will ripen just fine. Look for ones that glow an orange-ish gold - they'll be the sweetest and best-flavored. 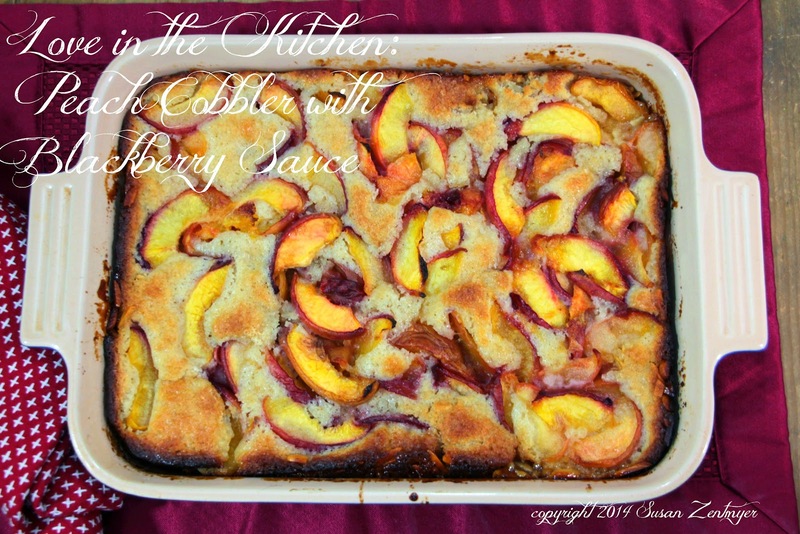 You don't need to peel the peaches for this recipe - I think it adds a nice color. If you want to peel them,cut a shallow X in the blossom end and place the fruit in boiling water until you can see the peel start to lift away where it's been cut. Depending on the ripeness of the peach, this can take anywhere from five seconds to a minute. Retrieve the peach with a slotted spoon and place it immediately in an ice-water bath to stop the cooking. The peel should just slip off. In a 9"x13" pan, melt butter and stir in almonds. In a large bowl, whisk together flour, sugar, baking powder and salt. Stir in milk and egg, mix to combine. Pour evenly over melted butter and almonds. In another bowl, combine peaches, sugars and spices. Spread this over batter. Now for the easy instruction: DO NOT STIR! Bake at 350 degrees for about 35-45 minutes or until batter comes to the top and turns golden brown. Meanwhile, in a small saucepan, combine blackberries, sugar and wine (or water). Gently mash some of the berries so that they can incorporate into the sauce in the sauce.Simmer over medium heat until liquid has reduced by half. Remove from the heat and let cool. 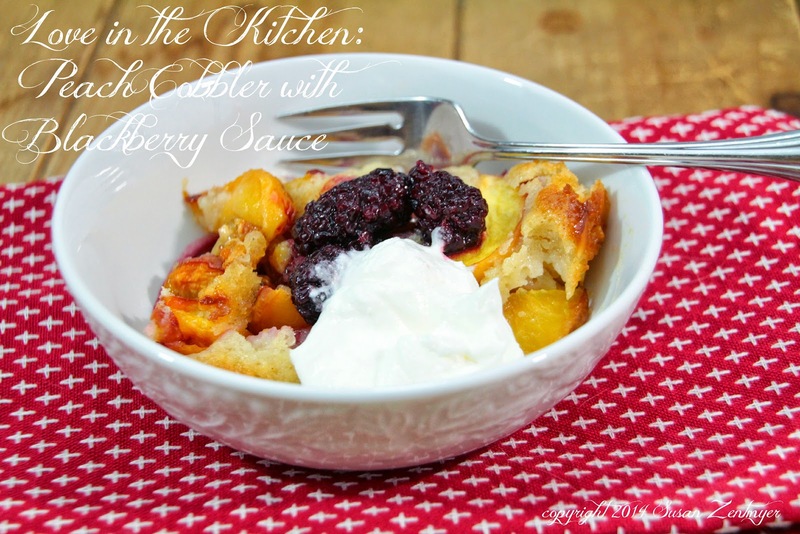 Serve cobbler in bowls with blackberry sauce and a scoop of whipped cream. Yummy I love Blackberries. And you don't have to peel the peaches. Wow.